William E. “Bill” Griner (1902-1984), son of Sarah and D. Edwin Griner, was the custodian at the Ray City School. He came to school very early every day and built a fire in the pot-bellied stove in every room. There were four classrooms and the soup kitchen in the old wooden building. In the brick building there were six classrooms, the principal’s office and the laboratory, each with their own stove. At Christmas, every student brought Bill a gift. Bill Griner had a home on Main Street in Ray City. This home was an unpainted, low, wooden bungalow on the north side of Main Street on the block of land between Ward Street and Samuel Street. His neighbors to the west were the family of Caulie and Marietta Smith. 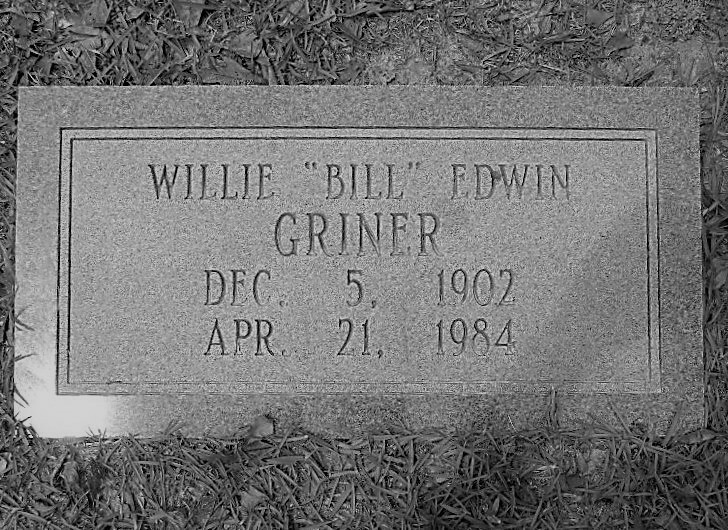 It appears that after the death of Robert L. Griner, Tessie Vining Griner and her daughter Sadie moved in with William E. “Bill” Griner. Sadie had a son nicknamed Peanut, and although Bill himself had only two years of formal schooling, he worked hard to make sure that Peanut made it through high school. Peanut later became a policeman at Remerton, GA.